Part two of a three part series on water heater repair explores common components of gas water heaters. Be sure to read part one and part three of this series as well. Gas water heaters are usually comprised of several elements that all work together. First off, there is the cold water supply. The cold water supply line provides cold water to the tank, and is controlled by a shutoff valve. Next, you have the hot water discharge, which is the pipe that feeds all the fixtures in your home requiring hot water. Then you have the tank. The tank is part of the water heater that requires the least amount of work. Most of the time, the most you will ever do to the tank is put an extra insulation sleeve on it. As to how it is heated, it uses a gas burner. Natural gas or propane has to have extra safety features. This includes the pilot light and gas burner. 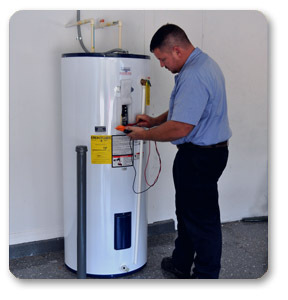 The pilot light and burner adjustment are key to proper operation of the water heater. The gas flame should about 1/2 inch in height and should have blue tips. An important safety feature of gas hot water heaters is the pressure relief valve. It relieves excessive temperature or pressure build up. This valve is located on top of the tank. The tank drain valve, on the other hand, is at the bottom of your tank and it removes sediment from the bottom of the tank. This helps to prolong the life of your hot water heater and reducing the need for water heater repair. Despite it’s reputation, natural gas is a fairly safe way to heat your home’s water. So take care of your heater, and if you have trouble, call in a plumbing expert for water heater repair.